Ce jeudi, le 11 septembre, on va se reunir a Michigan Theater pour regarder le film « Le Chef ». 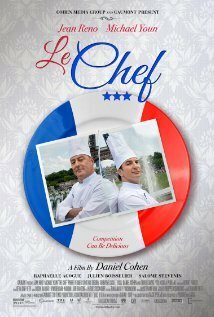 Le film : Self-taught aspiring chef Jacky (Michaël Youn) has the talent, but not the luck. Star chef Alexandre Lagarde (Jean Reno) is in danger of losing his reputation, along with his beloved restaurant. Fate brings the two together and helps them along a journey through the intoxicating world of French haute-cuisine. A legend in his own time, Lagarde is in serious conflict with Sanislas Matter (Julien Boisselier), the new CEO of the group that owns his restaurant. Matter is plotting to destroy Lagarde’s reputation so that he’ll have grounds to fire Lagarde and move the restaurant away from Lagarde’s classic French cuisine towards trendy molecular gastronomy. Desperate to cling to his status as a Three Star chef, Lagarde teams up with Jacky and together they try to find the balance between tradition and trend. L’adresse du cinema c’est 603 E Liberty Street, Ann Arbor. Le film commence a 19h15 (les horaires des films changent de temps en temps avec Michigan Theater, alors je vais confirmer mercredi soir par mail l’heure du film). On va se reunir a 18h50 DEVANT le cinema. Si vous arriver APRES 19h, vous pourrez nous rejoindre dans la salle du film. Le film c'est BIEN a 19h15...alors rien change pour demain!! dommage je ne pourrai pas être avec vous le jeudi, j'ai une réunion à mon école. J'irai le mercredi soir.